Mizoguchi's most perfect film (says me). Mizoguchi's cast could not be better, neither could Miyagawa's cinematography. However, it is really a(nother) tale by Saikaku (the same writer who provided the source for Life of Oharu). Saikaku published "What the Seasons Brought the Almanac Maker" in 1686 (in Five Women Who Loved Love), based on a recent true life incident. Chikamatsu wrote his bunraku play (Daikyôji Mukashi Goyomi) in 1715, based on the same incident. Mizoguchi's film draws on both sources, but contains a fair amount of the sly humor that characterized Saikaku's version (but does not seem to have been present in Chikamatsu's more purely tragic one). While Mizoguchi drained much of Saikaku's (often a bit sarcastic) humor from his (otherwise wonderful) Life Of Oharu, his Chikamatsu monogatari perfectly maintains the blend of (occasional) humor and deeply heartfelt tragedy found in Saikaku's "Almanac Maker". Thank you for the history Manny. I'll certainly pick this up. Certainly don't think it'll be popular with the family though. To second Michael, the film is somehow lighter than would seem possible from the content of the story -- less devastating at any rate than Sansho or Oharu. I enjoyed this a lot when it was screened at the Siskel a few months ago. The supplements seem pretty thin on this one. I’ll likely keep my Eureka unless the new transfer is outstanding. Yes, next time Criterion, please think outside the (MoC) box: Portrait of Madame Yuki! I think this just may be Mizoguchi's most purely visually beautiful film. I love it despite finding the story just a wee bit problematic. Because of the comic leavening, this film has a MORE powerful impact on me than either Oharu or Sansho. Wikipedia states that Madame Yuki is in the public domain here in the States so a release doesn't sound unmanageable. Last edited by Big Ben on Wed Aug 15, 2018 9:35 pm, edited 1 time in total. Just when I thought I'm done with buying Mizoguchi films on DVD/Blu-ray, then comes along this announcement! It's my favourite Mizo as well and I'm going to triple-dip on this for the 4k resto. 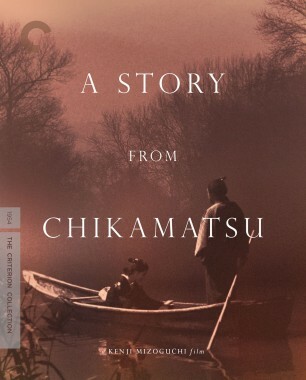 Why Criterion preferred "A Story From Chikamatsu" to name this film over "The Crucified Lovers" -much more appealing, much more dramatic- which is the most widely known name in the West? Other films are included in the collection with their most popular names in English. Yes, there was! It's from Chikamatsu, in case you haven't heard. And get this, according to Michael, it's "just a wee bit problematic"; therefore, there's nothing worth worrying about! It's Madame Yuki's plot that I said was "problematic". Duh! I should have thought outside of the (MoC) box! If Chikamatsu monogatari is that PERFECT, I surely will triple-dip. I already bought the French DVD (released early this century, remember that?) and the, ahem, MoC DVD. I also have the French set (with the only available DVD of Taira Clan, albeit only with French subs), and the MOC BluRay. Well, this was Kurosawa's favorite Mizoguchi film (if that counts). I watched this again on the MoC DVD last night, after not having seen it for many years. It has held up very well. An excellent film! I don't know which will haunt dda more, missing out on the OOP MoC Blu-ray boxset or having an unseen ghost story sitting on the shelf staring at him every morning. Heeding domino' advice seems like something that will help mitigate the problem. It also happens to spoil the ending. Of course, at the time it was made, its intended Japanese audience would probably known/guessed the ending regardless of the name (just knowing it was by Chikamatsu would be a tip-off, and knowing the specific source work would make it even more clear). So, only Western audiences unacquainted with Chikamatsu would be surprised by the ending in any event. (And, of course, the film actually starts with a pair of lovers on their way to be crucified). Spoilers should never be a thing when one is dealing with adaptations of classic works of literature/theater. dda -- If you have Ugetsu sitting around, why not watch it?